Alas, the reality is often quite different. But it's not my System that is at fault, but the way many people play it. They are still using habits from years of failed play with their own methods. And that usually means they play a couple of dollars a game. And without my System, they fail and give up. How do I and some other winners get such a high number of wins, while others give up early? Gerald Murphy, 52, from Mayo county in Ireland, played the same numbers for more than 25 years before he claimed the prize. He never gave up! 1. Winners NEVER give up. I often talk about persistence being the top quality that a lottery player should possess. This is never truer than with our biggest winner, a $22.2 million jackpot. Lee played for almost a year before clinching this sum... a time that not many others would have done. That's the difference. 2. How do you become more persistent? You have a dream. You want to win more than anything else. This is how people win in all other parts of their lives too. They see something and go all out to get it, whatever it takes. The only difference here is there is very little sacrifice playing with my System. There's no 10,000 hours of learning then competing in a small market for the same dollar here. With the System, all it takes is a few dollars and the ability to remember what day your game plays. 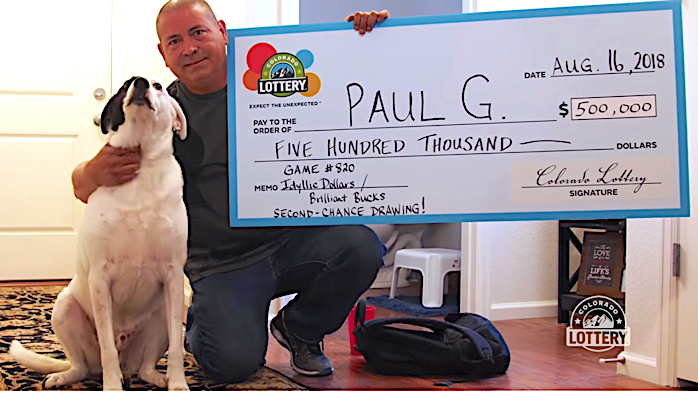 Lottery winner Paul G played frequently, and won three prizes totaling $1 million in the Colorado Lottery. He’s seen here with one of them, a $500k prize. 3. Winners play frequently. This morning I got an email from a Silverite wanting to know how to get better results playing $5 a day. This is the wrong way to play with my System. While the secret is in the number selection, the way of playing is not: You need to play each week with as many tickets as you can afford. Do not miss a game. Our player should have played once a week with $35 instead of daily. 4. Winners celebrate every victory, no matter how small. Many of us win each time we play. I've even gotten 22 winning tickets in a single game, my record. The secret is in these multiple wins... because any one of them could be the jackpot prize. Every single prize - no matter how small - should be celebrated for that reason. 5. Winners know there is not just one secret. It's the same with my System. The Silver Lotto System is made up of three parts...the basic System, LottoPredict and PRO. While 20% of our players just use the basic System, the other 80% have either LottoPredict and PRO. Like any skill, you need to use a range of tools to complete a job. Imagine a plumber arriving at your sink with just one wrench. Lottery players need all the parts to do the job too. Check out the PRODUCTS menu above.